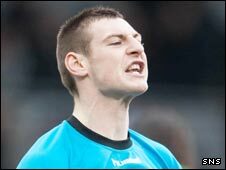 St Mirren goalkeeper Chris Smith will be out for up to a year after suffering damage to his cruciate ligament. The 23-year-old will undergo corrective surgery on his knee next week. "The early indications are that he could be out of action for up to 12 months," manager Gus MacPherson told the St Mirren website. "Chris is extremely disappointed. He had only recently got back into the team but it is something he has just got to deal with." Smith's injury came to light during the squad's trip to Spain earlier this month following their Homecoming Scottish Cup quarter-final win over Celtic, but MacPherson is confident Mark Howard can fill the void left by Smith. "We're not really sure of how and when Chris picked up the injury - it came to light when we were in Spain when his knee gave way during a training session," said the St Mirren manager. "Once the surgeon has had a look inside Chris' knee, we'll have a far better idea of the extent of the damage. "He'll come back from this and be much stronger, both physically and mentally. "We now have Mark Howard and a couple of younger goalkeepers to back him up, I'm happy enough with that situation. "Mark had an excellent first half to the season but needed a rest, which gave Chris his opportunity but Mark is now back in and we have total confidence in him."